PA makes clear payments for terrorists and their families will continue despite cabinet decision to apply law for offsetting terror funds. 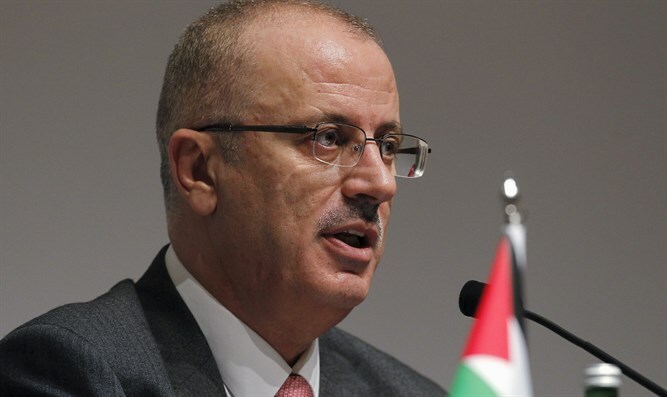 PA leader Rami Hamdallah announced that the PA would pay salaries and allowances to terrorist prisoners and their families today or tomorrow, according to Kan.
Senior PA official Hussein al-Sheikh also said that salaries would be paid today, and that these payments "are at the top of the list of priorities." Two weeks ago, the cabinet approved the implementation of the freeze on funds to the Palestinian Authority, which was passed by the Knesset in July 2018, and offset 502,697,000 shekels ($138,426,818) from funds transferred from Israel to the Palestinian Authority. Figures presented by security officials indicate that in 2018, the Palestinian Authority transferred the said amount to terrorists imprisoned in Israel, to their families and to released prisoners. Therefore, it was decided to freeze the same amount of money from the taxes collected by Israel for the Palestinian Authority. Prime Minister and Minister of Defense Benjamin Netanyahu instructed security forces to deepen the examination of other payments that the PA pays in connection to terrorists and their families. Insofar as further information is received, the amount to be frozen will be updated accordingly.